One of the problems about private local variables inside closures is that you can’t see them. Well, duh, you might say, that’s what private means after all. Point taken, but there’s one scenario where it would be really nice to be able to check those enclosed (enclosured?) variables: debugging. 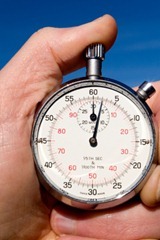 Back to our stopwatch example – the initial simple version. Now, I will admit that, as written, it’s ruddy hard to unit test this little object. That’s because I’m embedding, essentially, a random process in the middle: the current time. To properly test this I should extract out the code snippet that gets the current time (the weird-looking +new Date() statement) and build it in as an external interface that I can then mock. But let’s say I want to debug this code after I’ve called start() and before I call stop(). 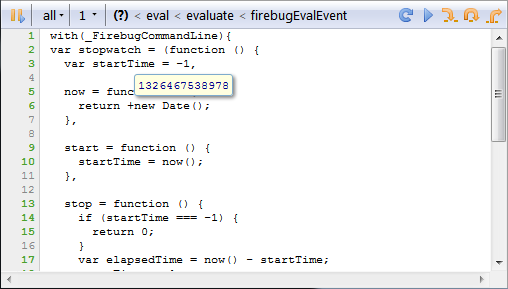 As written, there’s no way I can inspect the local variable startTime if I’m in a debugger. The stopwatch object is opaque. So what, you may say. Whether you have a manual breakpoint or use this fancy debugger statement, you still have the same problem: you can’t see inside the opaque stopwatch object. True. . . unless you execute the debugger statement inside the context of the closure itself. Notice that this new function is inside the closure. 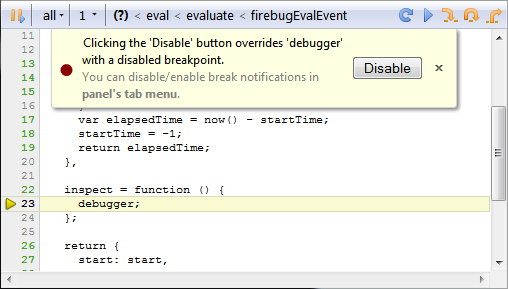 If we call stopwatch.inspect() from the Firebug console, for example, the breakpoint will be triggered, and will be triggered inside the context of the closure. We will be able to see the value of startTime (and modify it if required). Now the program execution has stopped inside the closure, you can inspect the value of startTime to your heart’s content. Now, I’ll be the first to recognize that this technique is a little invasive – after all, you have to write this special function and expose it publicly – but it does nicely solve the “I can’t inspect the values of the locals inside my closure/module” problem.